Spiraea ‘Goldflame’, or spiraea japonica ‘Goldflame’, is one of the several varieties of spiraea on the market. Many cultivars of spiraea have been developed throughout the years, which is usually a reliable indication of a plant’s popularity among gardeners, garden enthusiasts and landscapers. And indeed, spiraea ‘Goldflame’ is a real bestseller compared to other flowering deciduous shrubs. 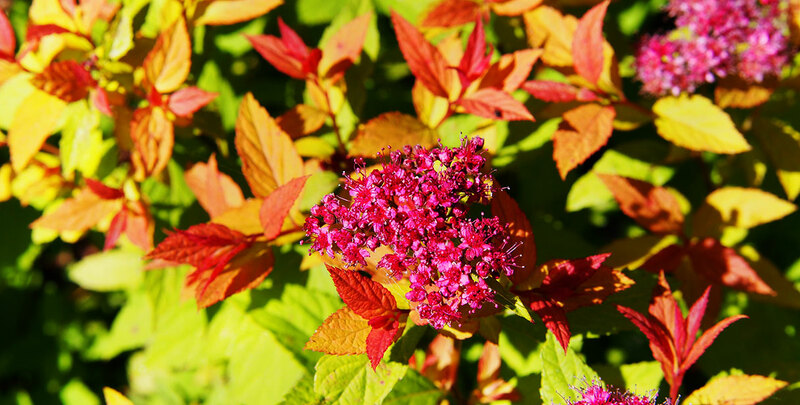 Spiraea ‘Goldflame’ features eye-catching dark pink or even crimson red flowers borne in clusters, which appear in July and remain on the shrub until early September. The flowers alone will add plenty of colour to your garden, but they don’t have to do it all by themselves – the leaves, which come to life in spring, have a lovely bronze-red tinge at first, turning yellow and eventually greenish as the season progresses. For a touch of colour and summer interest to borders, parks and gardens, spiraea japonica ‘Goldflame’ is the plant to go for. Spiraea ‘Goldflame’ has an exceptionally compact growth habit combined with a slow growth rate. Its growth habit keeps it from growing too large and as a bonus eliminates the need for regular trimmings and prunings. This, however, does not imply that it is entirely maintenance-free: an annual pruning session in spring is very beneficial and ensures a more shapely and more profusely flowering shrub. Faded flower heads can be deadheaded to make the shrub yet more attractive. Spiraea ‘Goldflame’ is a tough shrub in many different ways, tolerating a wide range of soil types, positions and even temperatures far below zero (-35C). Spiraea ‘Goldflame’ makes excellent informal hedges and can even be cultivated as a ground cover.